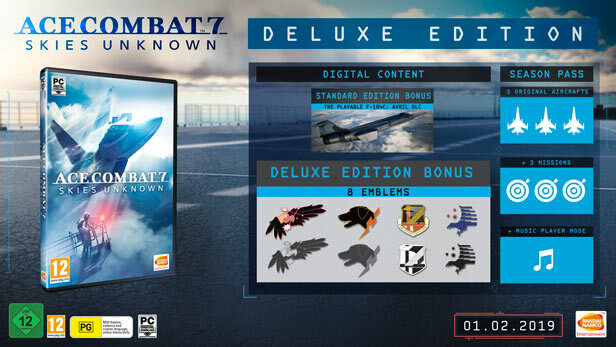 L'édition Deluxe de ACE COMBAT(TM) 7: SKIES UNKNOWN inclut le jeu ACE COMBAT(TM) 7: SKIES UNKNOWN complet et six packs de contenu additionnel compatibles avec le Season Pass. Précommandez ACE COMBAT(TM) 7: SKIES UNKNOWN et obtenez l'avion F-104 d'Avril (DLC) en bonus. ACE COMBAT(TM) 7: SKIES UNKNOWN & ©2019 BANDAI NAMCO Entertainment Inc.
All trademarks and copyrights associated with the manufacturers, aircraft, models, trade names, brands andvisual images depicted in this game are the property of their respective owners, and used with such permissions.